When i subtly said a couple of years ago that i was looking at this wagon, little did i know what a floodgate of requests i would receive to allow me to consider actually going ahead with it. I did say that i would not do any more crowdfunding models unless it was for a third party, but this one has really hit home and i have decided to try and get it going. With this in mind i formally announce today the OO and N gauge HUO 24.5t hopper wagon. Please note that i have 'taken a flyer' and the model is now in cad/cam stage and i am really hoping that this is completed so i can get 3D resin prints on display at the upcoming Warley 2017 show (no promises though). OK, details..... The model, should it reach crowdfunding levels to pay for the tooling etc, be made in both OO and N gauge, and feature a fully detailed hopper and chassis. And will be released in a single deco wagon, and 4 x 4 packs (packs 002-005) at a slightly lower price than the combined price for 4 single models. No money is required up front, only when the model in either gauge goes to tooling. The model will only go to tooling once the threshold to allow this has been reached by enough customers pre-ordering. Please note that for every wagon sold a donation will be made to the NWPG without who's help, this project would be more difficult to process, and i thank them profusely for their help in making the plans available for both this type and the originally announced type, which will allow me to re-visit the model and make a second version in a couple of years. Please note this production will be in Pre-tops condition initially, although if demand warrants it, i will do the sam thing multi pack and single wise for a run of ‘tops’ versions. All prices do not include postage to you, and this will be notified once the project is tooled ready for production. For those that wonder what this will cost, the price for crowdfunding these is based on 2000 units for N gauge and 3000 for OO gauge, and includes tooling, unit cost, shipping to the UK, and of course VAT. Please feel free to order as many as you wish for yourself and friends, and spread the word. For example if 500 people in OO gauge ordered 1 x 4 pack each the project would be over the line and a 'go'! What era would these have run in ? The "like" button does not do justice to this. I particularly rate the idea of doing 4 different 4-packs of these and can see a lot of people ordering those to make up a complete train. If you can't get this project to run at those quite modest numbers, one really wonders about the future of rtr models. There are plenty of experts on here much better qualified than me. But I think 1960s to 1990s but 1970s onwards with a TOPS classification. Edit: I nearly wrote 1950s but then had doubts. However, the thread usefully linked by Mike below shows the first being built in 1954. Quite a lot of variations though so date will depend which diagram DJM chooses. This thread will give you a lot of info, particularly the first post. They were in use until the mid to late 1980's. Perhaps another manufacturer is eyeing up this wagon or maybe it's just spoilers? Modellers being a fickle lot may not be prepared to put their hands in their pockets if the is any truth in this? Could the market withstand two RTR models and an excellent kit? I'd hate to see time and money being wasted. Welp, I'll be pre-ordering both the individual packs plus the 4 packs. According to Paul Bartlett's website they were built from 1954, finally being withdrawn in the "Later 80s". Being un-braked (hence the O part of the TOPD code) they would still need a brake van on the end of the train. 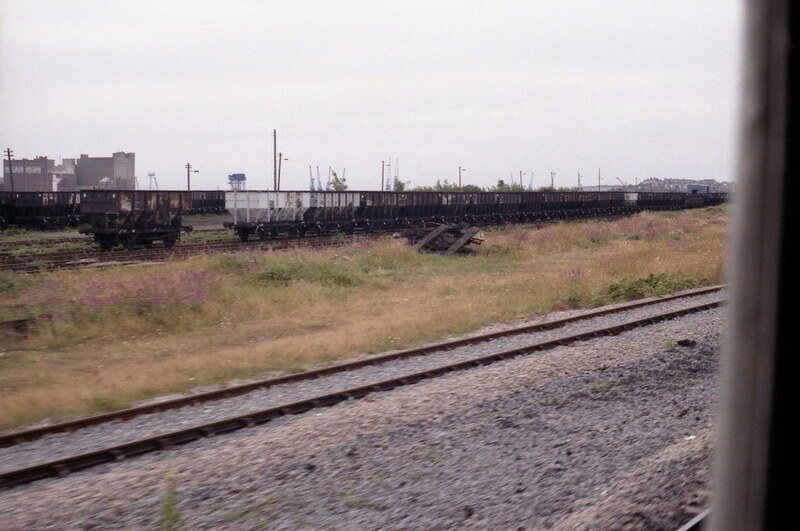 If my photos below are anything to go by, the last use in South Wales was in 1986, as the second photo of the pair below shows quite a collection of them in the sidings at Barry in July 1986. I can't remember seeing many in use after this in South Wales, which was the last place they were regularly use, I think! 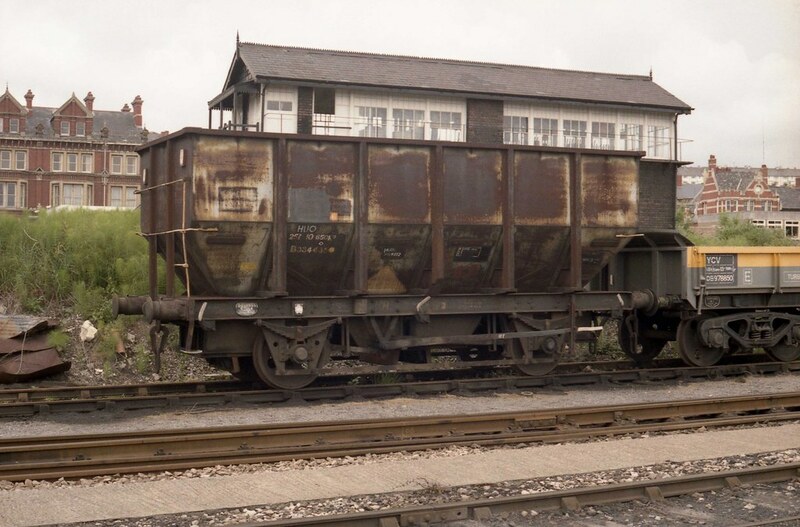 The first production wagons (the prototype, once modelled by K's, was somewhat different) appeared in August 1955. There was then a hiatus of almost two years, before production resumed, this continuing until the end of 1964. Other flows included coke from Beckton (East London) to Wellingborough, and some odd flows. One was from Cheddar, another was from Tunstead Works to Smaledale Works, and a third from Hessle Quarry to Hull Wilmington. The Cheddar flow was probably from Foster Yeoman ( at this time a relatively small concern, who were not yet exploiting Merehead), the one from Tunstead, limestone for ICI, and the third either limestone or chalk. Details of numbers and original allocations can be found in 'Wagons of the Middle British Railways Era' and 'Wagons of the Final Years of British Railways' by David Larkin. Most of the power station flows lasted until the advent of MGR services, and the construction of the late 1960s generation of power stations. Two of the last flows to use the wagons were from Gedling Colliery to Spondon Power Station, and coke from various South Wales coking plants to Barry Docks, as shown in Paul J's post. The 1954 wagons had a very different style of brake gear (LNER Clasp type) compared with the later, 1958 onwards variants, which had a single shoe per wheel and offset brake hanger. From the RMWeb archives - the Gedling - Spondon coal train on a snowy day. Why can’t this low cost (compared to a loco of course) model be a company funded item, it might inspire some confidence in your ability to deliver perhaps ? I understand money doesn’t grow on trees, however if your producing non profit making at least in the first run models under crowdfunding your not actually making any money to reinvest and push forward core range models? What happened the Class 59, Mogul, Q6 or similar? A very short circuit in the West Midlands in the early 1980s at least (probably quite a period prior) was Daw Mill colliery to Hams Hall power station. Probably because the latter was never equipped for MGR operations. Okay guys, we get it, Dave’s way of operating isn’t the particular cup of tea for a lot of you - but is it not possible for him to do anything without being given criticism about the way he is doing things? Do I want Daves models to come out faster / include more engines / not be crowdfunded because this erodes my ‘confidence’ / be here right now this second / waaaahh etc? Yes I do. Do any of us have the faintest idea of how to run a model railway manufacturing business? Nope. Dave’s pocket can’t produce more than he is producing. The little knowledge I do have of these processes is that we are now talking close to £200k for a model of a loco, and £100k for a wagon in each scale, particularly if tooling variations are required. So instead of making us wait until he has the cash free (which frankly could be at least a couple of years), he’s offered the model to us and ASKED us to fund it - if we don’t like it we don’t have to sign up do we? There is no risk to our money whatsoever and we get our model much sooner and cheaper than if we waited for it to hit the shelves. Just a quick update and an apology. The order section for the OO and N gauge HUO won’t be live until Tuesday as my web chap and I are meeting then. I’m hoping to get the standard DJM pre orders and crowdfunded orders into 2 tabs on my web site rather than 1 long list on 1 page. This will make things easier to find. Both tabs I hope, will be on the home page as well. Sorry for the delay, and have a great weekend. Who said he’s not making a profit? Of course he will be making a profit. What’s the point in doing it if he’s not? Dapol took the Class 59 too, hence Daves model won’t be out.